The latest innovations in drive-train, chassis and safety will see future MINI models build on their segment-leading position. Since 1959, the unmistakable go-kart feeling has been at heart of the British marque’s DNA. Today, every member of the MINI family has the combination of agile handling, exemplary efficiency, contemporary comfort and uncompromising safety. With the typical innovative strength expected from a premium manufacturer, MINI seeks to set standards for the future in developing vehicles and technologies that transform driving into a unique experience. A new generation of engines is now about to optimise the balance between driving thrills and fuel consumption yet again. 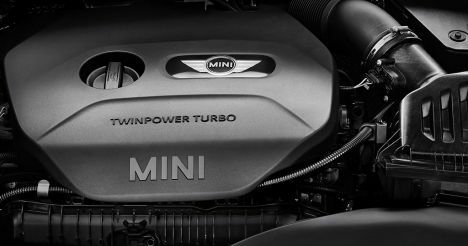 Future MINI models will be the first to use both three and four-cylinder engines, not only covering a broader performance spectrum, but also setting new standards in terms of output, performance, comfort and reliability. The quality of the new engines is a direct result of the unique development expertise of the BMW Group in the area of drive technology. Thanks to the brand and model-specific design, they have performance characteristics synonymous with the MINI driving experience. The advances achieved by MINI in the area of drivetrain technology are characterised by the consistent further development of tried-and-tested design principles and the integration of innovative technology. Both in terms of design and in the coordination of all chassis variant, MINI developers will continue to emphasise sporty, agile handling. In addition, MINI will introduce electrically adjustable dampers for the first time. The electric control of the damper valves will make it possible to vary the nature of responsiveness to uneven road surfaces. Two characteristic curves will be available for damper adjustment that can be activated at the flip of a switch. Depending on the driver’s preferences, a decidedly sporty drivetrain setting or something more balanced and comfortable can be selected.